Not feeling in the holiday spirit? Have a disdain for eggnog and tinsel? If that sounds like you then you would fit right at home in the cave above Whoville where the Grinch himself resides with his dog Max! Even though his heart grew three sizes, the Grinch is still one of the greatest Christmas curmudgeons of all-time. He may have been a grumpy old green guy, but you have to admit that he was quite creative and charming. Look at those plans to ruin Christmas - they were definitely ambitious! And how he was able to talk to the little Susie Who into going right back up the stairs because he was definitely, totally, the real Santa Claus. He was kind of a genius! If you look up to this kind of behavior, then this Grinch costume is right up your alley! Steal presents from the Whos, take down their stockings, and take the bulbs from the Christmas lights, then meander back up to your mountain where you can be at peace. 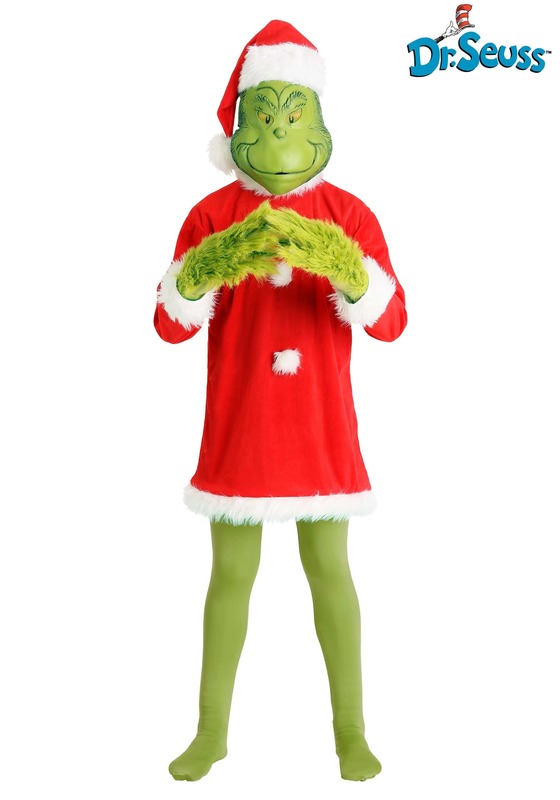 This costume is perfect for those who just aren't feeling jolly during the holidays! It comes with a red polyester Santa jacket that has fuzzy white trim at sleeves and the bottom. The bottom of the coat holds its shape with a wire hoop. The costume also includes Grinch gloves with green faux fur and a latex Grinch mask for his signature scowl. And don’t forget the included Santa hat - it will complete the look!